Area S-6 is the sixth course of Rainbow Summit and the seventy-ninth course overall in Mario vs. Donkey Kong: Mini-Land Mayhem!. Two Mini Marios begin near the very center, one directly above the other, while the other two begin at the top right, with the exit door on the middle left. In order to reach it, they must simply be guided via a series of Purple Conveyors to it. The M-Token is located at the middle right, just above a Purple Conveyor connector. To collect it, a Mini Mario must simply approach it from the left, then a switch must be tapped in order to prevent the Mini Mario from falling into the nearby Spike Trap. The Mini Mario Card is located at the top center, just above the two center Mini Marios. 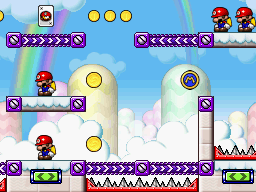 One of the Mini Marios on the top left must simply follow the Purple Conveyors from its starting position to reach it. In Plus Mode, the Mini Mario must be guided to the exit door first, followed by the Mini Toad, then the Mini Peach, then finally the Mini Donkey Kong.